When it comes to electronics, silicon will now have to share the spotlight. In a paper recently published in Nature Communications, researchers from the USC Viterbi School of Engineering describe how they have overcome a major issue in carbon nanotube technology by developing a flexible, energy-efficient hybrid circuit combining carbon nanotube thin film transistors with other thin film transistors. 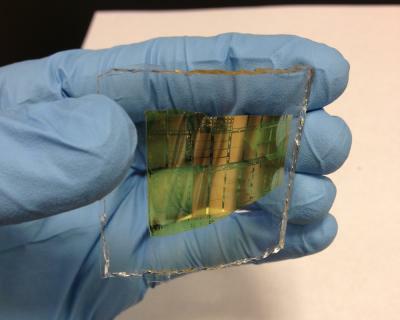 This hybrid could take the place of silicon as the traditional transistor material used in electronic chips, since carbon nanotubes are more transparent, flexible, and can be processed at a lower cost. Electrical engineering professor Dr. Chongwu Zhou and USC Viterbi graduate students Haitian Chen, Yu Cao, and Jialu Zhang developed this energy-efficient circuit by integrating carbon nanotube (CNT) thin film transistors (TFT) with thin film transistors comprised of indium, gallium and zinc oxide (IGZO). "I came up with this concept in January 2013," said Dr. Chongwu Zhou, professor in USC Viterbi's Ming Hsieh Department of Electrical Engineering. "Before then, we were working hard to try to turn carbon nanotubes into n-type transistors and then one day, the idea came to me. Instead of working so hard to force nanotubes to do something that they are not good for, why don't we just find another material which would be ideal for n-type transistors -- in this case, IGZO -- so we can achieve complementary circuits?"